My studio is almost together, but I had to stop working on it to focus on the house itself, so that we can move in by the end of the month. It’s a satisfying but exhausting experience. Everything I do is for the long term: no throwing on paint to make a room livable; instead, it’s careful (and, yes, tedious) preparation followed by meticulous execution. Still to go is more painting and then laying floors. Here are some photos of the initial transformation of the garage into my studio. 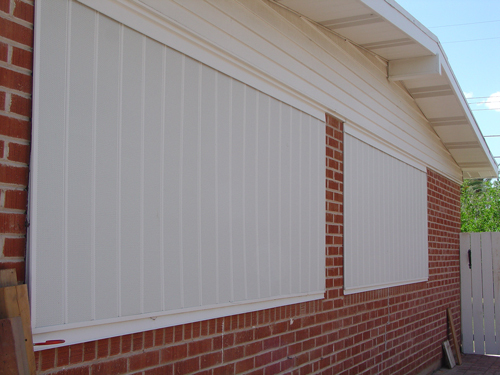 As you can see, the aluminum siding covered simple wooden louvers. 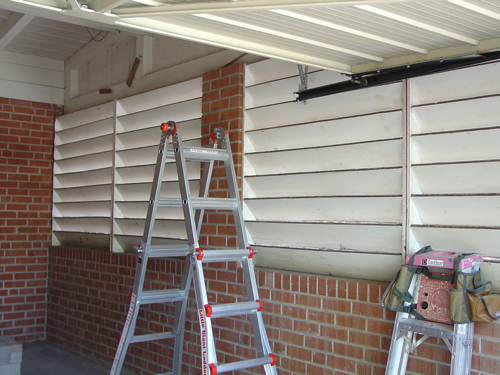 I dismantled them and used the wood to frame the windows and air-conditioner and the siding on the outside, as well as for a frame for my dust collector, as you will see in later photos. Recycle! 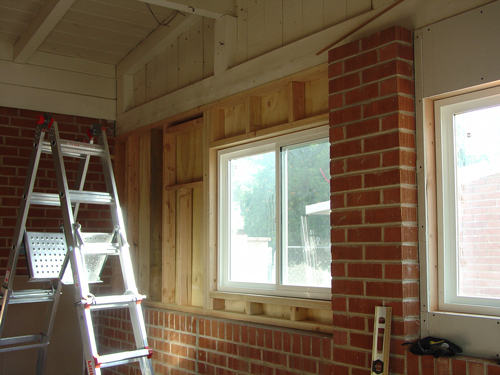 Under the tutelage of my friend Art, I learned to frame a wall, install windows, put in insulation, put up drywall, and much more. 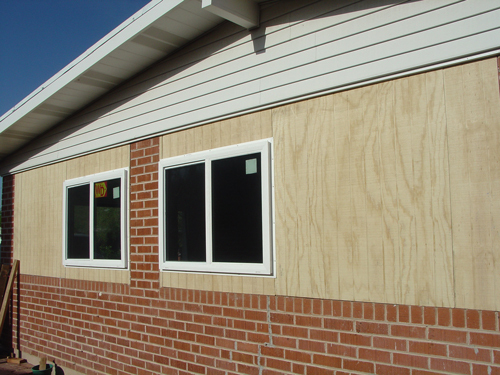 In this photo, one wall opening has been framed and drywalled; the other is in process. Since this photo, I’ve installed an air-conditioning unit and added trim around everything. I still haven’t finished caulking and prepping, and I still need to prime and paint, but I will get to it, I swear. 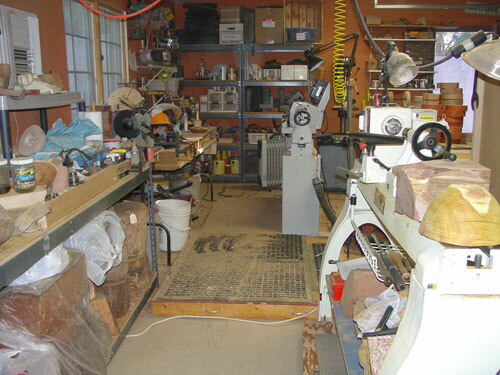 And inside, I’ve added a lot of new equipment—bandsaw, belt sander, drill press, dust collector—but haven’t yet moved over my lathes and tools. Except for a demonstration, I have not turned since the end of April. I miss it, but I am finding satisfaction in these other pursuits. It is exhausting, though, so I make no promises as to resuming regular updates to my blog. My partner and I close on the purchase of our first house in less than a week. This means I will have my own studio for the first time! I’ve been having fun shopping for new equipment and planning my new space, which will be in the garage. The electricity in the garage is insufficient, so I am having an electrician install a new panel and a bunch of outlets. A friend of mine and I will frame one wall and install windows and a room air conditioner. Besides working on my studio, I will also be laying new flooring in the house and repairing walls and painting and doing maintenance on the roof, so it may be a month or two before I actually return to turning full-time. In the meantime, I can still work in my current studio—whenever I’m not working on the house or packing and moving our stuff. I will try to keep you up on the progress of my studio. I have been avoiding blogging because this has been the most stressful month I can remember in years! Besides, I’ve barely had time to turn. But very soon I’ll have something to blog about again. An interesting week, not terribly productive in terms of finished work, but I did make progress in less direct ways. I prepped two pieces of wood, one mulberry, the other eucalyptus. Both were heavily checked, and this may have caused some of the problems I had, though ultimately that didn’t appear to be the case. I started with the mulberry and the least curved of the curved blades, trying to remove the largest possible core. I cut the first couple of inches without problem, but then the blade began to catch, and catch hard, so that the lathe stopped altogether, and this with minimal forward pressure. I tried systematically adjusting as many variables as I could identify—widening the kerf, changing the angle slightly, pushing even less, making sure the blade was up against the cross brace, etc.—but the blade kept catching. I finally switched to the eucalyptus chunk and fared better. I got much deeper without a catch, then when the blade did begin to catch, I was usually able to back off a little and resume without the lathe stopping dead—though it did stop a few times. Eventually, I was able to cut the whole core out. Woohoo! The wall thickness of the outer bowl was even fairly consistent, so I had followed the outer curve pretty closely. I was exhausted by the effort, however. I went home early, and I was ready for bed by 7 p.m. that night, whereas (as some of you know from my posting times) I’m usually a real night owl. And I was clearly using muscles I wasn’t accustomed to using, because I had pain in my hand, my elbow, and my shoulder! I haven’t given up on the Center Saver by any means, but I do have to set it aside for a while as I concentrate on preparing for my next show, which comes up in just a little more than four weeks. My inventory is still low from my fall shows, so I need to get in gear and get productive. In the meantime, if anyone has any suggestions on improving my Center Saver technique, please share! Also this week, Pat and I rearranged the studio, relocating my old lathe to the opposite end of the room, in front of the garage door. I also finally installed pegboard on the divider behind my lathe, so I have my tools better organized and at hand, which will let me be more efficient. Of course, that means that the shop photos I just posted are already out of date. Ah, well. 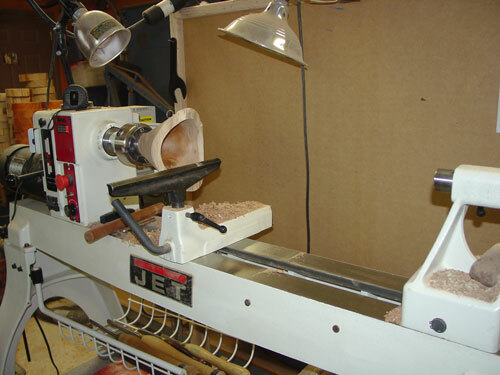 I’m gradually getting settled with my new lathe in my still-newish studio digs, but here are some pictures, finally. I plan to install pegboard on the divider behind my lathe for easy tool access. I’m still finding places for many things. In the meantime they clutter my work bench. Notice the handy space for wood storage below my bench. You can see the lathe (a 1.5-hp Delta) and work space of the studio’s owner and my shop mate, Pat Reddemann, in the background. Right now, my old lathe abuts the new one. The plan is to set up my vacuum chuck on the old lathe for both Pat and I to use whenever, without having to change the setup on our primary lathes. 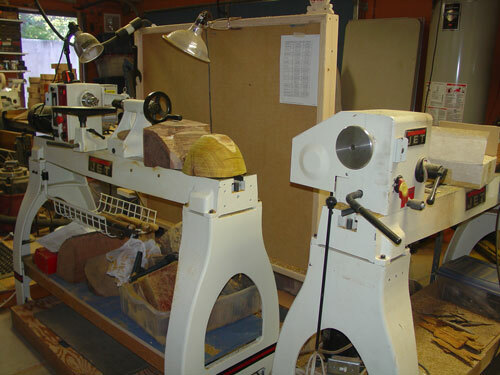 We will probably find a new spot for my old lathe soon, so I’ll have more working room at the end of my new lathe. 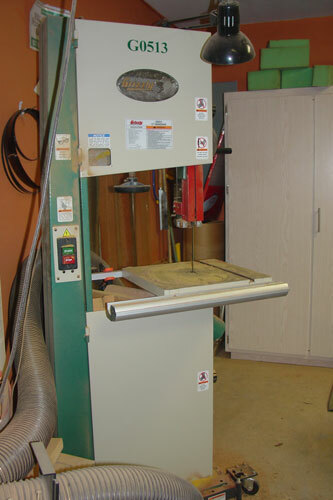 Pat got this new 18″ Grizzly bandsaw just a couple of months ago and has already gone through several blades. 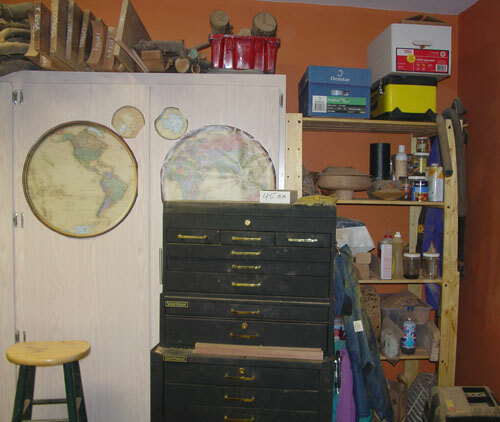 This storage area and my tool chest area to my right as I face my lathe. The cabinet is full of wood. 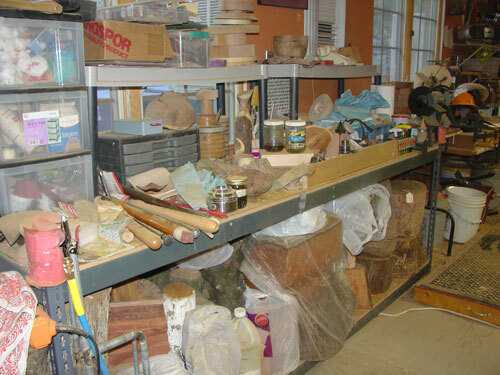 The shelves hold mostly half-finished pieces and finishes and solvents. 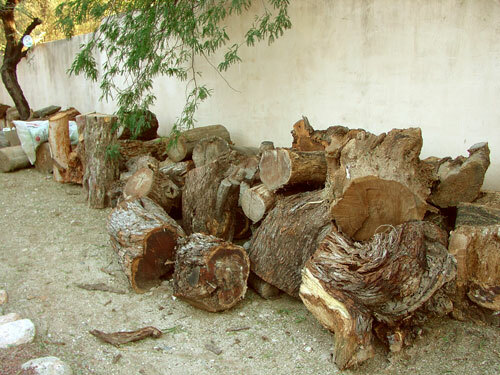 Pat and I share larger logs we’ve harvested together: a lot of mesquite, but also some African sumac and pepper tree. 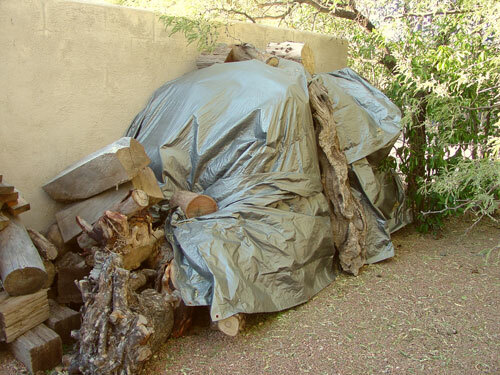 Under the tarp is yet more of the wood I’ve harvested from locally felled trees, mostly mesquite.